Sydney artist Mitch Cairns, a four-time Archibald Prize finalist, has won the 2017 Archibald Prize with a stylised portrait of his artist-partner, Agatha Gothe-Snape. Gothe-Snape is a significant contemporary artist exhibiting widely both in Australia and overseas. “I composed this portrait with love. Agatha and I share everything in our lives; our two-year-old son; our work as artists and our day-to-day lives,” Cairns said. “Initially I made loose drawings of Agatha, just in the flow. It’s a domestic scene. When you have a young child there’s a lot of creative play happening on the floor. “In this portrait Agatha’s in an ‘uncomfortably comfortable’ pose; legs crossed, head turned, on our rumpled rug,” Cairns said. Art Gallery of New South Wales curator of Australian art, Anne Ryan, said Cairns’s work is graphic and incorporates an economical use of palette and line. 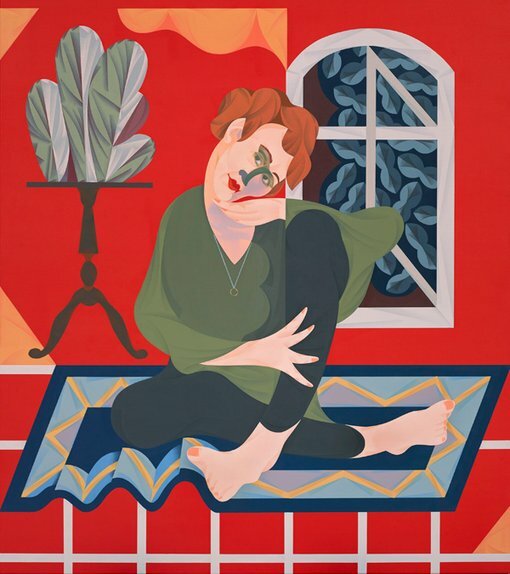 “No doubt the endearing intimacy of Mitch’s portrait of Agatha, also a highly regarded contemporary Australian artist, will charm audiences,” Ryan said. “There is a clarity to the collection of objects surrounding Agatha that highlights the domestic nature of the portrait, revealing tell-tale marks of the couple’s home life,” Ryan said. Art Gallery of NSW director Michael Brand phoned Cairns this morning with the news he had won the 2017 Archibald Prize. “I was thrilled for Mitch. In 2014 and 2015 his Archibald portraits of Reg Richardson and Peter Powditch respectively were judged highly commended. Mitch has also been a recipient of the Brett Whiteley Travelling Art Scholarship, in 2012. “The sensitive portrait carries Cairns’s signature playful complexity and this, along with his composition of form and colour, will no doubt draw comparisons with the style of Matisse and other modernist masters,” Brand said. Cairns completed a Bachelor of Fine Arts (Hons) in painting at the National Art School, Sydney in 2006. The 2017 Archibald Prize had 822 entries this year from which 43 finalist portraits were selected. Of the 43 finalist portraits almost half chose artists as sitters, with 19 of them depicting artists including a double portrait of another artist couple, James Drinkwater and Lottie Consalvo. The Archibald Prize winner is decided by the Gallery’s Board of Trustees. Board president David Gonski said today’s judging was a harmonious process. “There were many great Archibald contenders this year, but it was the skill and sensitivity of Mitch’s portrait which left a significant impression on us all,” Gonski said. Mark Whelan, ANZ Group Executive Institutional, congratulated Cairns on winning the Archibald Prize. “To win the Archibald Prize is an outstanding achievement, so we congratulate Mitch Cairns,” Whelan said. “The Archibald Prize is one of Australia’s most prestigious art awards, and is unique in its celebration of artists and their subjects from all walks of life. ANZ is proud to be associated with this iconic exhibition for the eighth consecutive year,” Whelan added. Betty Kuntiwa Pumani from Antara in South Australia is the winner of the 2017 Wynne Prize. Following on from the success of fellow APY Lands artists the Ken Family, who won the Wynne Prize last year, Pumani’s distinctive painting of her mother country captivated the judges. “My landscape work is my country, Antara. This is my grandmother’s country. My family is responsible for taking care of this country. The Ancestors taught the lessons of taking care of country, and these lessons have been passed through the generations,” Pumani said. “When I paint my country I am celebrating the culture of my country, and am taking my turn passing on these lessons, passing on the Tjukurpa (cultural story) to the next generation of Anangu. This is how we keep our culture strong,” she added. Joan Ross is the winner of the 2017 Sulman Prize for her mixed media work Oh history, you lied to me . Ross is a first-time finalist in the Sulman Prize this year and was thrilled to hear today that she had also won. “I am so excited, I’ve entered this prize so many times over the years and this was my first year being accepted as a finalist,” Ross said. “This work is really important to me because it discusses our ongoing issues in Australia arising from colonisation. I’m so happy that so many people will have a chance to see the work and keep these issues as a point of discussion,” Ross said.